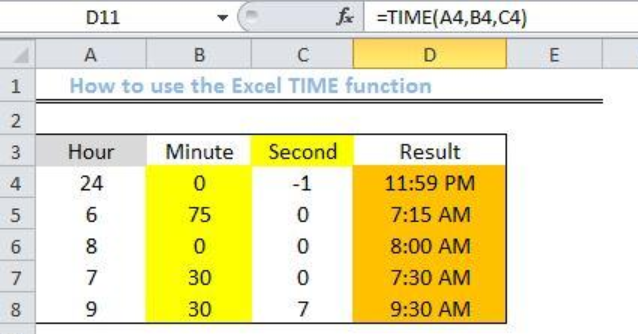 We can use the Excel TIME function to create time using its individual components like hour, minutes and seconds values to return with a decimal number representing the specific time. The steps below will walk us through the process of using this in-built function. We will create out a possible list of data as displayed in the figure below. We will insert our formula in Column D to arrive at the decimal result. Using the fill handle tool (a plus sign located at the base of Cell D4), we will drag down the formula into the other Cells. We use the TIME function to create a serial number format (decimal value) from its hours, minutes and seconds component. 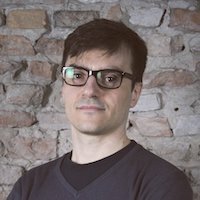 However, you must always use a valid component, because a valid component will always return with a valid time which can be formatted in your own way. 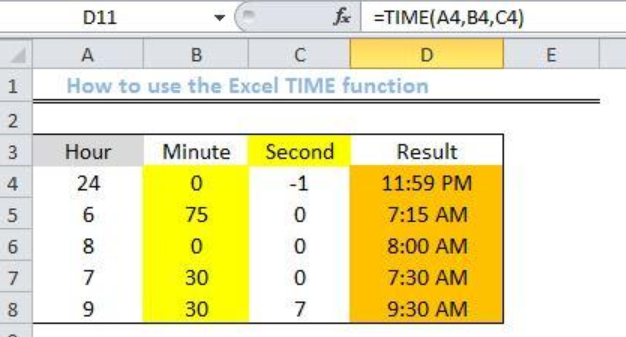 Use the TIME function together with the SUMPRODUCT function to achieve the sum of the total amount of time over 30 minutes. 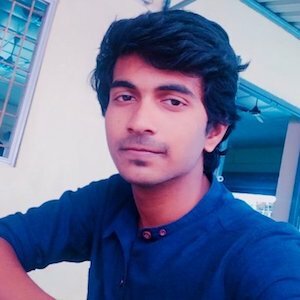 Count the number of time in a given array by combining the TIME function and the COUNTIFs function. When minutes or seconds are over 60, they will be rolled over to the hour or minute respectively. When there are no components of some cells in a particular row, then zero will be inserted in the empty cells to prevent an error result. The returned time will be in decimal form. Right-click and click on format cells. Click on time and select the time format. I have a spread sheet to calculate payroll. I enter the time in and time out with a paid lunch. anything over 7 hours is time owed. When no lunch is taken .30 time is owed. My columns are Date/ Time In/Time Out/ Regular Hours "=sum(time in-time out)*24"/ Time Owed "=If(Reg hours>7,(Reg hours-7), (0))"/NL/Time Used/Balance "Time Owed+NL-Time Used". How would I set this up? I can not get it to add the .30 when no lunch is taken. 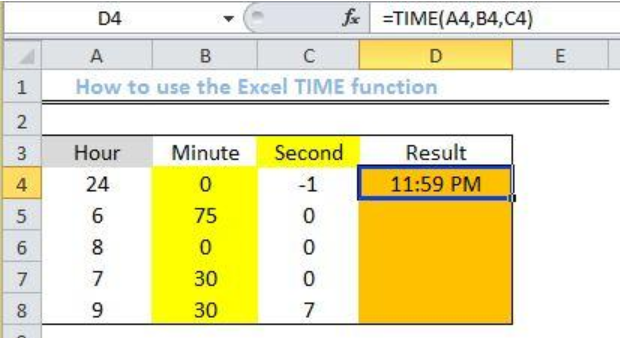 I want to subtract my Stop Time Cell from my Start Time cell and have it output my Actual Time in minutes in another cell. For Example Start Time Stop Time Actual Time (mins) 0:34:27 0:36:27 2 How do I enter in the Stop Time and Start Time to get that output?